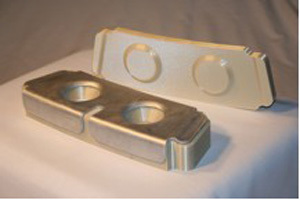 Stratasys, Eden Prairie, MN, will showcase its Fused Deposition Modeling (FDM) technology, which can be used as an alternative tool-making process for metalforming with hydroforming or rubber-pad press processes. Compared to machined tools, using FDM allows for freedom of design and proves quicker, less expensive and less labor-intensive. The process also proves ideal for repair and refurbishment work, for products with a high probability of design revisions, and for low-volume production.